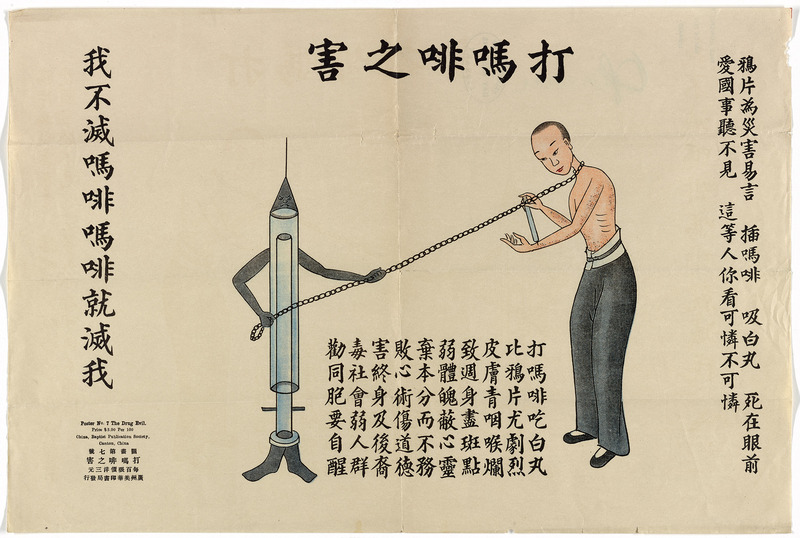 In the poster, there is a syringe needle holding a person with a chain around their neck. The needle is gripping the chain. The person is also holding a separate needle and they are currently injecting themselves in the arm with the needle. The picture consists of just the person and the needle with words all over the poster. The caption talks about how injecting morphine is bad for a person and that it will destroy your body. In the poster, the condition of the person is seen through the fact that there are bruises on their arms and the rib bone lines are seen explicitly. In the caption, it is suggested that injecting oneself with morphine is worse than opium. I find this interesting because opium was a huge problem in China’s history. There was even a huge war about the issue of opium in the country. This image relates in a historical context through the fact that we have learned what the Chinese outlook is towards drugs. They are seen in a negative light. The poster was also made by the Baptist Publication Society. 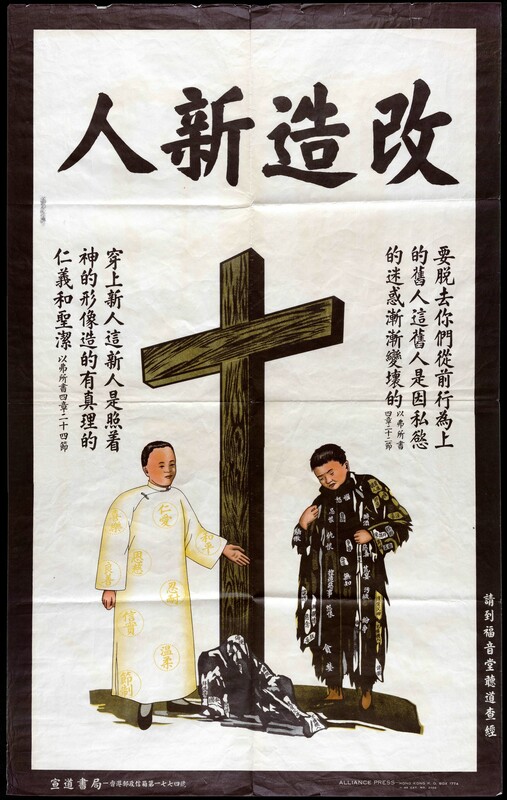 The content in the poster makes sense because to the missionaries in China, using opium was bad because it would disobey God’s commands. One way the missionaries could help fulfill God’s plan was to lead people into converting. Before missionaries were banned in China, many helped to take in orphans. These types of stories are related to the Ho reading; it is the same how the Henke’s took in Ai Jung. I think that this poster is effective because it is trying to prove to the viewer that injecting yourselves with drugs is not the way to live life. It can control your life which is why the big needle is holding the human with a chain. The human is practically a slave to the needle. From observing other posters from the publisher (Baptist Publication Society), they have a collection of posters that try to let the viewers know that some social activities are dangerous and control people lives. The people in the collection of the poster are attached to an evil spirit by a chain, meaning that they wanted to show that people who follow these things are unable to control their lives. Their posters want people to know the bad side of people continue to do these social activities. A question that I have about the poster is if the poster was made at a different time or at a time where there wasn’t much of a social negative aspect towards opium, outside of the views of Christian missionaries, would opium still be seen as that bad? Like if this poster wasn’t made with a Christian perspective before a lot of the population was addicted to opium, would this have affected how opium would be used? In the photo are three people: a farmer, politician, and a soldier. They are standing near each other where they are holding different things. The farmer is holding farm tools, the soldier is holding the world, and the politician is holding a sheet of paper. In the poster they are standing on a pathway in front of what seems like a factory that is by the mountain. Each person represents something. The farmer represents the livelihood of people, the politician represents democracy, and the soldier represents nationalism. From my takeaway of the poster, I think these three people are supposed to represent China as a whole. The elements of the poster show the modernization of China. 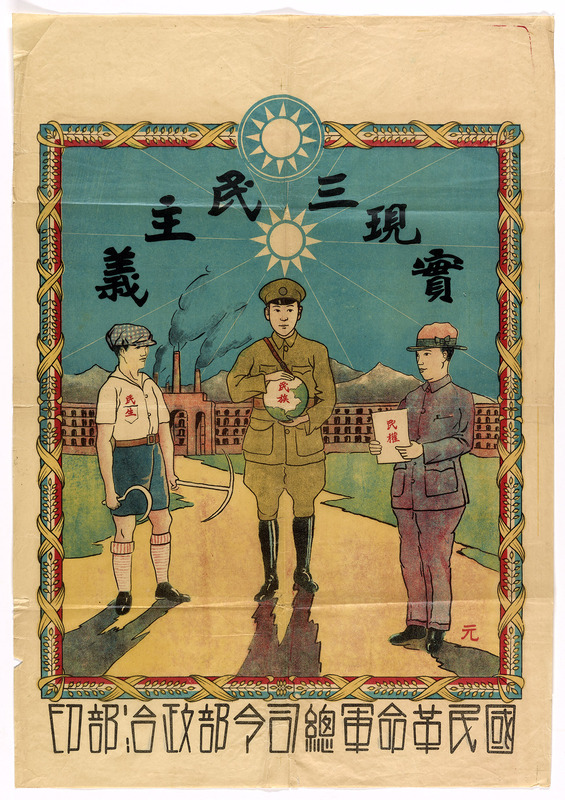 The poster can also represent Sun Yatsen’s Three Principles of People through the representation of nationalism, democracy, and the livelihood of the people. The farmer is holding tools that I think are in the symbol of communism, which is interesting because Sun Yatsen pushed for socialism. The people are wearing modern clothing, not traditional clothing. After Sun had moved to Western places, he became more towards western standards and the clothing in the poster helps to show the perspective that Sun wanted. He paid attention to the way government was run in those areas and believed that being more progressive is what China needed. The poster was made by National Revolutionary Army Headquarters- Office of Politics and this poster was probably made by this organization because during this time, the First United Front was trying to find a way to change the infrastructure in China’s government. They wanted to bring socialism to the people. I think that they wanted to show the people in China what they could be if the shift were to happen. They wanted to show how being traditional is boring and modernization is what is needed to be a force to be reckoned with. Also, at this time, the economy in China wasn’t progressing the way that it should have. The poster shows a person standing at a cross and there are two different representations of the person. One is them in dirty, black clothing and the other is the person wearing white clothing. The black clothing is supposed to show their previous life of sin and the white clothing represents their new life as a convert. The writing on the poster is of a scripture and also the words that are on the clothing of the male. The bottom of the poster also has the signature urging people to go to church to read the bible. I believe that the biggest message in the poster is that it is meant to be used as something to attract the attention of those who would like to be saved. The words on the clothing also plays a part in trying to get people to understand that if they convert to Christianity, they will become a better person. The pure clothing doesn’t have as many words as the original clothing that the person is wearing. There is supposed to be a representation of the process of shedding your old self to a new self. The clothes in front of the cross also say negative things that unclean people are. The visual representation is published by Alliance Press- Chongking-Hong Kong-Singapore. The company is based out of Hong Kong. The poster was probably made by people of Chinese descent and not missionaries from Western countries. Something important to understanding this poster is that this poster appears to allow converts to continue following their religion. This was something that was allowed thanks to the Treaty of Tianjin. Though this treaty allowed religious freedom, there was a downside. The Tianjin massacre happened due to there not being a full understanding between the missionaries and the Chinese population due to many orphans dying. Though the poster has specifically included a Chinese person, I believe that this poster could be understood in another cultural context. The message in the poster is pretty simple to understand. The message is seen through the graphic alone, without even a person having to fully understand the words on the clothing. Though the words on the clothing helps to understand the viewpoint presented towards those who are Christians and those who are not Christians. I don’t really have any questions because it is a pretty simple poster. One could be if the poster was created with a different religion in mind (Buddhism or Confucianism), different elements would have to be changed but would the progress of the person still be shown in the same way? I chose these posters because I wanted to show different sides. I focused on social issues, government views, and evangelism because I think that all three are important into understanding the views of China. Coming from a viewpoint of an American, more things are looked at as acceptable to there being different cultures mingling. From what I’ve learned about China in this class, there has been a lot of change that the country has gone through. In relation to each other, a viewer is able to see some of those views that some people wanted to enforce in the country. I also chose posters from those three topics because I wanted to focus on more than one topic of posters. I like these posters and how they kind of relate to each other but not explicitly. Two of the posters (A New Robe and The Drug Evil) can be related through the values of Christianity being shown. A New Robe and Three Principles of People can be related to each other through showing ideologies of Chinese people. Three Principles of People is about Sun Yatsen’s representation on how China should move to a republic standpoint and A New Robe shows how converting to Christianity will help Chinese people be better. All of the posters have the aesthetic style of emphasizing the meaning of poster in a straightforward fashion. A New Robe has the graphics in the center with the words along the outside. Those words happen to be mainly two different scriptures that discuss how those not following God are bad and those who are righteous. Three Principles of People shows through graphics how there should be three types of people in China and that they could all help China advance as a country. The Drug Evil poster wants to emphasize through its graphics that drugs are evil in all aspects and that God should be the main thing that people should follow. When looking at these three posters, some questions that an illiterate reader would get is what does this poster means in terms of what type of person I should be. I think that biggest problem that could arise would come from the A New Robe poster because it is important that a person would be able to understand the words on the clothing. To them, they might see it as two separate people. Though it would make sense that the person in the white clothing is the pure one and the one in the dirty clothing is bad.